Toothache is the common term for pulpitis, inflammation of the tooth pulp. Tooth pulp is the living tissue found in the tooth and it is a fragile tissue that contains blood vessels, nerves and connective tissue .The pulp is protected by the encasing tooth structure from bacterial infection. In the presence of decay, fracture, cracks or gum disease, the pulp tissue will be inflamed resulting in pulpitis/toothache. If pulpitis is allowed to progress, the bacterial infection will cause the pulp to degenerate and there will be an infected space within the tooth giving rise to inflammation of the bone tissue around the tooth root. The most common indicator will be pain from the tooth. The pain is typically described as lingering sharp pain to thermal changes or spontaneous pain in the evening. It can also be pain on biting. More obvious signs would be swelling and pus discharge from the surrounding gums. There are some cases where there can be no signs and symptoms to the patient but it can be deected through a thorough examination. -WHAT IS ROOT CANAL TREATMENT? The procedure itself can be done in one visit or several sittings. It is routinely done with the placement of a rubber cloth so that the tooth can be isolated. Several exposures for radiographs are required before, after and during and after the procedures to ensure that it is performed in accordance to standards. Filling of the canals usually with gutta percha (a rubber base material) and biocompatible cement. Usually root canal treated teeth will need a full restoration to protect it from tooth fracture. This will enable the tooth to resume its full function. +IS ROOT CANAL TREATMENT PROCEDURE PAINFUL? There are several anaesthetic procedures that can numb the tooth before root canal treatment can proceed. In some cases, the infection has caused the site to be more resistant to the anaesthetic and the clinician may need to adopt more measures to provide adequate anaesthesia. +WHAT DO I EXPECT AFTER ROOT CANAL TREATMENT? Transient pain can occur following root canal treatment and can be adequately controlled by oral medicine. In some uncommon instances, there can be swelling from the tooth following root canal treatment. The clinician will need to re-examine the tooth and decide on the necessary follow-up therapy. +DOES A ROOT CANAL TREATED TOOTH NEED SPECIAL CARE? A tooth that is root canal treated have a higher tendency to fracture. So patients should be advised not to bite hard foods before the tooth can be crowned or restored. +WHAT ARE THE COMPLICATIONS THAT CAN ARISE FROM ROOT CANAL TREATMENT? 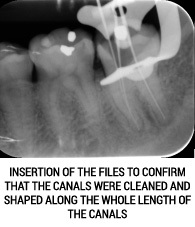 Sometimes after completion of root canal treatment, despite root canal treatment being appropriately performed and with no signs of infection or inflammation, the patient may felt that the tooth may not feel as it used to be eg. felt sensitive on biting or touched. Aberration of the tooth resulting in higher chance of procedural complications. To name a few: it can be calcification of the root canal space making root canal treatment challenging, very curved canals causing higher chance of instrument fracture, premature tooth or tooth with limited tooth structure that that may fracture during treatment. (Radiographs) When such complications occur, the success rate may be affected and other follow-up treatment may be required. +WHY DOES A ROOT CANAL TREATED TOOTH NEED ANOTHER ROUND OF TREATMENT? Root canal treatment usually has good success rates and it ranges depending on the pre-existing condition of tooth. Defective restoration that may compromise the seal of the root canal fillings from bacteria in the mouth. The abovementioned is a surgical procedure that is required when root canal treatment fails, signs and symptoms of the failure emerged. When such surgery is recommended, it may be because redoing root canal treatment serves limited therapy value. Following are the common instances where surgery is recommended. Persistent disease despite root canal treatment being done. Teeth with extensive restorations such as post and hard cores. Exploratory purposes for teeth with high suspicion of cracks. This can be performed under local anaesthesia and will require cutting the gums to expose the inflammed or infected tissue. 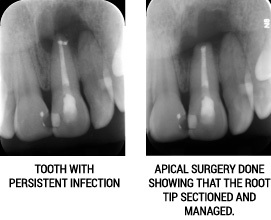 The affected tissue is then removed and the root is treated before the gums are stitched back. -WHAT IS A CRACKED TOOTH? A cracked tooth is different from a fractured tooth. A cracked tooth means it is an incomplete fracture of the tooth. A crack is a separation of the deeper part of the tooth structure and it propagates towards the pulp space and the gums. The extension of the crack is usually vertical in nature and not something that is routinely detected on radiographs. Once the pulp tissue is involved, toothache results and we term it as cracked tooth syndrome. Root canal treatment may be recommended to relieve the pain. Sometimes the crack may be very advanced and it may not be worth the time, effort and cost to save the tooth. The patient may be given the option of extraction and to consider other replacement options. +WHAT IS AN IMMATURE TOOTH? DOES THE ROOT CANAL TREATMENT OF AN IMMATURE TOOTH DIFFER FROM A MATURE TOOTH? The pulp is a tissue that is responsible for maturation of the tooth. Maturation means continued development of the tooth roots. A mature tooth root will have a thick root and a properly formed root tip. Root canal treatment for an immature tooth differs because the canal is large and the end of the canal is not shaped for a normal root canal filling. Placement of a medicament to induce a desirable shape of the canal end (Apexogensis). This usually requires a few sessions over 3-6 months. +WHAT ARE THE DIFFERENT KINDS OF TRAUMA TO THE TEETH? HOW IS IT RELATED TO ROOT CANAL TREATMENT? loosening of the tooth within its socket. These can happen concomitantly. Both of such trauma can affect the pulp tissue and it may degenerate like the way it does in a decayed tooth. For fractures of the tooth structure, they can be further classified by the type of tooth structure involved. The clinician will need to check the extension of the fracture and determine the need for root canal treatment before placing a full restoration. Modifications of root canal treatment may be required for some of the fractured teeth. For teeth that have been loosened, both the pulp and the surrounding tissue around the roots are affected. There are some mild cases that may not require root canal treatment for the time being and long term monitoring is required to ensure that the pulp tissue is not affected. There are some severe cases like intrusion (tooth pushed further into the socket) of the teeth or avulsion (entire tooth falling out from the socket), outcomes of such teeth may be considered poor. The outcome and treatment for the different types of tooth loosening varies and the clinician should explain what the treatment options and outcomes of the teeth are.